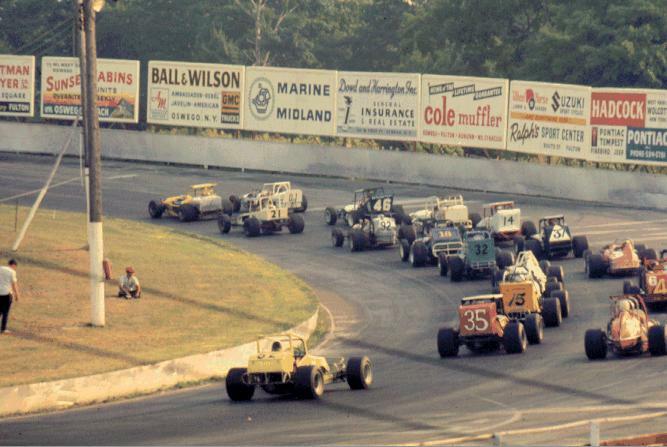 1968 heat race-from the front row to the back-Row 1-the yellow 59 of Neil Tooley, white #01 of Jack Greedy, Row 2-#21 Kenny Bartholomew and #46 of Warren Coniam, Row 3-#92 of Freddie Graves and the #80 of Jim Muldoon, Row 4-#18 of Jack Houseworth and the #14 of Art Bennett, Row 5-#32 of George Friend and #37 of Sam Carista, Row 6- the car on the inside I can't recognize, on the outside is #9 Wayne Landon, Row 7- can't see cars in either inside or out side, Row 8-#15 Mark Letcher and the #64 of Joe Hlywka, Row 9-#35 John Spencer and the #81 of Larry Gathman, and the yellow car rounding out the field is #52 Ron Thring. From the archives of the Ronald D. Nielsen Family. Thanks to Jim Liccardi.